Gifts will offer programming support for Enoch Pratt Free Library and Reading Partners. Christmas in Baltimore came two months early today, when Amazon surprised a group of second-graders from Liberty Elementary School with boxes full of new educational devices, toys and books for their local library. 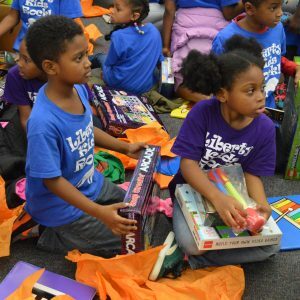 The delivery of more than $10,000 worth of technology, equipment, and STEM (science, technology, engineering and mathematics) toys to Baltimore City students happened at Enoch Pratt Free Library’s Forest Park Branch. 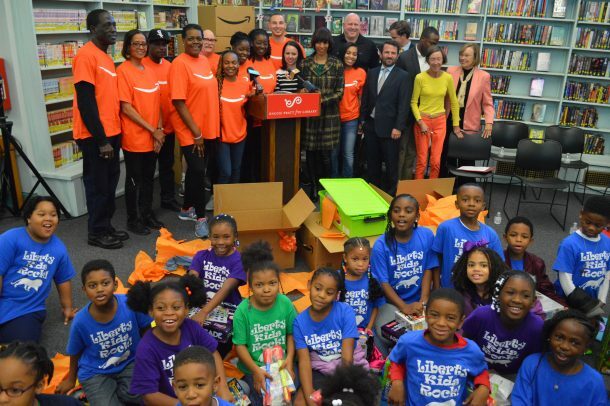 Joining the children were Mayor Catherine E. Pugh, City Council President Bernard C. “Jack” Young, Jeffrey Zwillenberg of Reading Partners of Baltimore, and Shan Byrne, Amazon’s Director of Operations at the Baltimore fulfillment center. Heidi Daniel, President and CEO of Enoch Pratt Free Library, not only hosted the exciting event, she also entertained the thoroughly-engaged children with two “story-time” readings, just before the presentations got underway. The surprise delivery of the STEM toys and other educational equipment is designed to help facilitate educational development and STEM exploration in new Maker Spaces at both the Forest Park and Patterson Park branches. Along with the educational equipment, Amazon presented a $10,000 check to Enoch Pratt to support programming throughout the library system, and $10,000 to Reading Partners, a program that places community volunteers, some of whom are Amazon associates in low-income schools, to help master basic reading throughout the year. In her prepared remarks, Mayor Pugh shared her own childhood experience, as a way of underscoring the importance of the community library. Turning to Byrne, Pugh said, “I am really very grateful for the investment Amazon continues to make in our city – not just because we want to be the headquarters for Amazon – but we are very proud of the work they do. I’ve been to the operations center and have seen all of the work that they do and all of the employees that they have hired, so again, I thank Amazon for that.